Booking your ski school in advance with us will cost you less than booking on arrival! Whether it’s your first time on the slopes or you’re an off-piste expert, there’s a level of tuition available to help you develop and refine your technique. 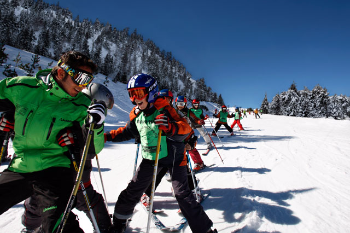 Ski school is also a great way to meet like-minded people and have some fun skiing together with everyone sharing hints and tips across the group. Once booked you will receive a confirmation email and voucher explaining what to do on arrival in resort and where to meet on your first day at school. Ski School is for everyone whatever your level of skiing or snowboarding it doesn’t matter. We have some of the best schools that have been recognised internationally with a service second to none! There are group lessons for beginners, intermediates and those lucky enough to be advanced. 5 days – Monday to Friday – 3 hours only on Monday then 4 hours Tuesday to Friday (3 in the morning and 1 in the afternoon) 19 hours total. Adults 18+, Youth 12-17 inc, Child 4-11 inc.